From New York to Wisconsin, the Great Lakes’ shoreline includes hundreds of family beach getaways for watersports, fishing and outdoor adventure. The Great Lakes of the United States and Canada make up one-fifth of the world’s fresh surface water. Between them all: Lake Superior, Lake Michigan, Lake Huron, Lake Erie and Lake Ontario (heading west to east), there are almost 11,000 miles of shoreline and some great family beaches, some perfect for tiny travelers. Geologically, the impressive Great Lakes region developed from the glaciers that moved across North America during the Ice Age. The Seaway Trail, a National Scenic Byway along the coast of Lake Erie, is a prime example of a glacial landscape shaped by wind and water. In a typical Midwest winter, the Arctic-like frozen landscapes of Lake Michigan (where waves freeze into “ice shelves”) and Lake Huron welcome active families who are into ice fishing and snowmobiling. In summer, the lakes come to life with beach-goers. Spring and fall belong to the anglers who come to catch the bass, trout and pike among the estimated 180 species of fish. From dense evergreen forests to cultivated plains, rocky shorelines and thousands of small lakes, these regions host more than 130 rare species and ecosystems. Wildlife includes white-tailed deer, black bear, bobcat, beaver, moose and a variety of birds. Yet it’s the shoreline, waterfront and sand dunes that attract most families. Unfortunately, the combination of populous cities and over-development throughout the Great Lakes has had an adverse effect on the lakes’ cleanliness, especially on the warmest lakes used for swimming. The EPA and environmental groups work constantly to monitor the condition of these critical freshwater resources, which continue to be damaged by toxic waste, air pollution and the introduction of invasive species. Before you plan a visit, be sure to check with local tourist offices regarding water quality. Despite the pollution, the lakes are so large (they contain 95% of the United States’ fresh water) that they continue to support an unusual diversity of flora and fauna. That’s why the Great Lakes remain an attractive recreation area for families in the Midwest and south central Canada who enjoy watersports such as kayaking and canoeing, and biking, hiking and camping in the wilderness. Here are some of our favorite Great Lakes beach getaways for the family in Ohio, Michigan, Indiana, New York, and Wisconsin. Generations of Ohio families have spent their summers on Put-In-Bay, a charming island of Victorian homes and B&Bs in Lake Erie. Many visitors, surprised that Erie is large enough to have waves, hop on a highspeed ferry for the day, rent a bike, and explore. Put-in-Bay has a pretty town square with some restaurants, small dark sand beach coves for swimming, and excellent fishing, hiking and biking. Don’t miss Perry’s Victory and International Peace Memorial, which commemorates the Battle of Lake Erie during the War of 1812, which established peace with Britain and Canada. Neighboring Kelleys Island, more distant, is much less developed. Visit the site of Discover Ohio for more information on these Lake Erie Islands. One FTF reader wrote us about happy summers spent on Association Island, a small Lake Ontario island near Watertown, New York. Although it’s only about 65 square-miles in size, the island has been at times a Native American meeting place and a French colony for traders from Canada. At the turn of the 20th century, it was bought by General Electric as a company retreat, and later sold to the YMCA. A private owner turned the whole island into an RV park and campground and it recently became a KOA campground. Due to its isolated location in Henderson Harbor, NY, and windy climate, the island has been used by U.S. Olympic sailing teams for training, and is still popular for sailing and watersports. The KOA 1,000 Islands Campground has more than 300 RV sites, many on the water; tent sites, a marina, and five rustic, furnished cabins that sleep a family of four for less than $160 per night. It’s open annually from May to October. Michiganders love to head to Sleeping Bear Dunes National Lakeshore, a beautiful quiet beach on Lake Michigan where the water is so gentle and shallow that it’s relatively warm — a perfect place to introduce tots to splashing in the water. Lake Michigan is home to the world’s largest freshwater dunes. Newcomers should stop by the Hart Visitor Center in Empire for maps and information on the Great Dunes and where to climb them. Marching uphill in the sand is fun and guaranteed to tire out your kids quicker than anything. Afterwards, pile into the car for a seven-mile drive along the Pierce Stocking Scenic Trail and admire the views of Lake Michigan and Lake Glen. Families with teens looking for action may prefer Traverse City, also on Michigan’s Upper Peninsula, but a much more developed tourist town, especially on summer weekends. 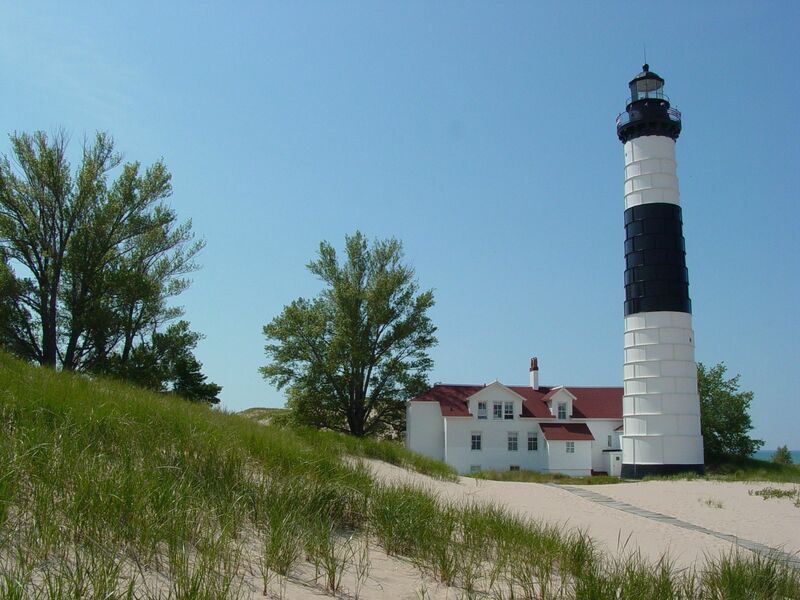 Pure Michigan, the state’s travel division, will provide maps, itinerary suggestions and information about camping or hotels. On the western coast of Lake Michigan in Indiana, look for the Indiana Dunes National Lakeshore where 15,000 acres of beach, sand dunes, bog and wetlands are used for recreation by more than 3 million visitors annually. In Porter County around Chesterton, families flock to Indiana Dunes State Park, a subset of three miles along Lake Michigan’s south shore where unusual drifting sand hills make for a beautiful day at the beach. You’ll find a beach pavilion with bathhouses and a snackbar, and lifeguards are on duty from Memorial Day to Labor Day. This state park has campsites in use three seasons, since many visitors come for birding after the summer. In late fall, surfers come out to enjoy the waves whipped by falling temperatures. All year round, families can engage in the local Three Dune Challenge, a 1.5 mile climbing course that’s much harder than it sounds. For more information, visit Indiana Tourism. Warm and welcoming, Lake Michigan is also the source of much fun on the east side of Wisconsin’s Door County Peninsula. Flanked by Green Bay to the west and protected by 10 lighthouses, Door County has a myriad of touristy activities, ranging from boating around Green Bay’s harbors, to beaching, five state parks and shopping for antiques, to satisfy all ages and interests. Cherries and apricots are found at farm stands in summer, and celebrated at seasonal festivals. The relatively small (865 acres) Whitefish Dunes State Park in Sturgeon Bay is the busiest one in the state and the focus of many summer activities. Rimmed with a forest of beech trees, the dunes are a fine white sand ideal for sand castle building. The park has a boardwalk where power walkers and those pushing strollers can circle Clark Lake and watch the ducks, or watch for wildlife at Old Baldy or Whitefish Creek. Year round programs for all ages include a tour of the remains of eight Native American villages within the park, and naturalist-led walks along the many trails. The Travel Wisconsin office has more information about accommodations and sightseeing. 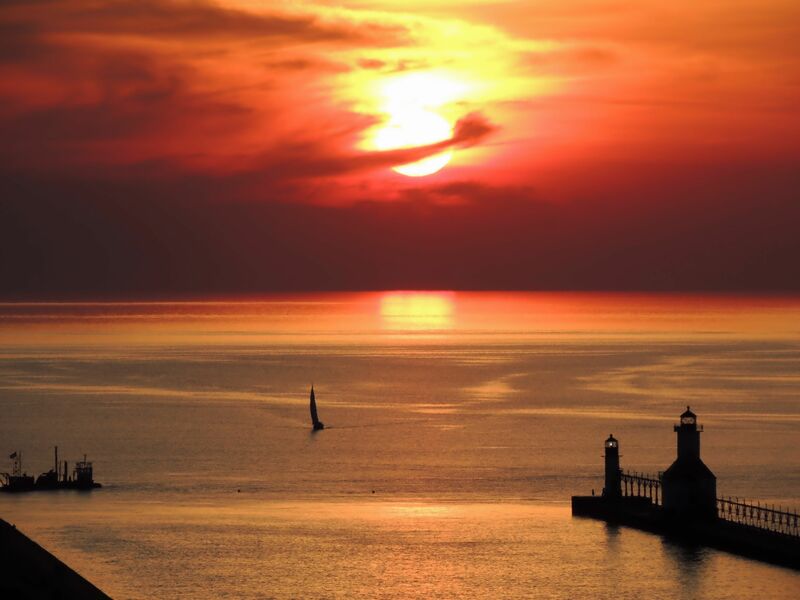 For more information about the Great Lakes and other sights to see, check out the Great Lakes Information Network. You will enjoy your vacation in our luxurious Kauai Vacation Rentals and Cottages.